Updated for Mists of Pandaria 5.3. See our Mage overview page for general info on patches, talents, glyphs, abilities, etc. See the spec pages, below, for more detailed PvP info. Flameglow took a nerf in 5.3. It absorbs less damage and might also be affected by battle fatigue. Now it’s probably only valuable against DOT classes, such as Affliction Warlocks. Temporal Shield might be the “go to” talent now, if you can time it right. Incanter’s Ward was changed. Less burst and longer duration. With the short cooldown you should be able to keep this up nearly 100% of the time. Living Bomb was buffed (and the explosion was nerfed.) The DOT part was buffed nicely and it doesn’t break your team’s CCs until it explodes, unlike Nether Tempest. (Refreshing LB constantly will make sure it never explodes.) It’s also (and was always) instant, which is a big advantage of Frost Bomb when the other side is actively interrupting your spells. It also now scales nicely with Haste. There’s very little reason to use Nether Tempest anymore. Generally Mages are very competitive. Hunter/melee teams are really the only ones causing grief. You’ll just have to outplay them. Check out Skill-Capped for info on how to outplay anyone. Arcane PvP: Lots of damage, pretty squishy. Fire PvP: Lots of damage, better mobility, crit dependent. Massive damage when the crits line up. Still squishy. Frost PvP: Lots of survivability and CC, less sustained damage, but still quite nice. Still the spec of choice for Mists of Pandaria PvP. Mage gearing for PvP – Your Mage has just hit 90, here’s how you should handle your PvP gearing. Mage Overview – Lots of general Mage stuff. Mage Leveling – Still need to get to 90? This is the page you want. Hit & Expertise: What you want is Spell Hit, and you Expertise and racial Expertise bonus (if you have one) both factor into your Spell Hit, as well as your regular Hit rating, of course. Arcane and Frost should do the same for Haste. Gems with secondary stats have twice the value of gems with primary stats, so your Haste gems are 320 points and your Int gems are 160. This gives more reason to match socket bonuses. Note that patch 5.3 nerfed PvP Power AND and changed the Resilience rules. Both had their gem values cut in half. You should now gem for Int as your #1 stat. For most cases you will want to use these and you do want to match socket colors for the bonuses. Meta Tyrannical Primal Diamond: +665 PVP Power and +775 Resilience, requires 27k earned conquest points and iLevel 476, cost 1k conquest points. The only Resilience enchant in the Chest piece, there are no PvP Power enchants. This means your enchanting will be mostly the same for PvP and PvE. Weapon Enchant Weapon – Glorious Tyranny: 400 PvP Power, 200 Resilience, 50% Disarm reduction, cost is 1,000 Conquest points. You have to earn 25k CPs to be able to access the vendor, 27k to be able to buy the item. Enchant Weapon – Windsong: Sometimes increase Crit, Haste, or Mastery by 1,500 for 12 seconds. Jade Spirit is much better, this one is much less expensive. As of Mists of Pandaria Shatter is now available to all mages. Freeze your opponent before nuking and get a massively increased crit chance. Presence of mind: Great when you need an instant cast of a spell with a long cast time. Add it to a macro. Blazing Speed: A nice escape from snares and movement buff (even if it’s a brief one.) It’ll save you Blink for other uses. Ice Floes: Lets you cast your next two cast time spells while running, such as Frostbolt or Pyro/Arcane blast. Avoid this. Temporal Shield – Nice when being pressured, if you can survive for 4 seconds. The only issue is that you have to time it properly. Flameglow: Nerfed in patch 5.3. Deflects some of any incoming damage. Best use if you’re talking a lot of small hits, such as from DOTs. Ring of Frost – nice for blocking pathways or freezing groups. Landing a Ring right before Frost Bomb detonates will make good use of your Shatter ability. Ice Ward – We’re not healers and aren’t usually in charge of protecting allies, so this isn’t so hot. Nice for kiting opponents, though. Frostjaw – Silence, root, and Freeze all in one. Get a proc (such as Pyro,) freeze him and burn him. Very useful. Greater Invisibility – Fade away, remove two DoTs, and escape.This has definite use. A nice “get our of Dodge” talent. Cauterize – Nice if a healer is keeping an eye on you or you remember to ice block right away. Coldsnap – nice for emergency heal and/or refreshing cooldowns for more Shatters. 3 min cooldown, though. Nether Tempest – This is the pick if you mainly fight single targets. Living Bomb – With the 5.3 buff this is, at least, on a par with Nether Tempest and has certain advantages, such as not breaking your team’s CC until it blows. Frost Bomb – This would be sweet if it was instant like the other two. Especially if it blows in the middle of some frozen opponents. Invocation: Get a nice damage boost every time you Evocate. Incanter’s Ward: Absorbs damage, boosts mana regen, and buffs Spell Power. What’s not to like? Need to Get to 90? Fast? Once you have the right build in mind for your Mage your next step is to get a full blown Mage leveling guide for the most effective (fastest) leveling. Why? With thousands of quests and a million mobs to grind the trip to the highest levels can take awhile. A long while. An in-game leveling guide makes the whole trek a whole lot easier. Pick your starting point and the guide will show you where to go, what to do, and keep track of your objectives (such as Kill X of…). 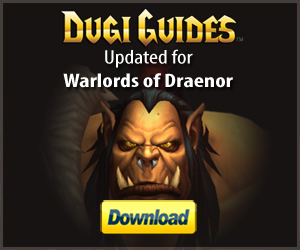 Dugi’s Guide automatically updates and advances as you complete tasks and quests, sets a waypoint arrow automatically (always showing you where to go next,) and includes all the important quest info.